Plants having weird problems |Sundews Etc. I've got a few plants right now that aren't looking so hot. Get well soon little guy. I recently featured this Drosera aliciae plant enjoying being fed, but now all the most recent leaves are black and not developing. I have no idea what this means! The other D. aliciae in the pot is looking great. 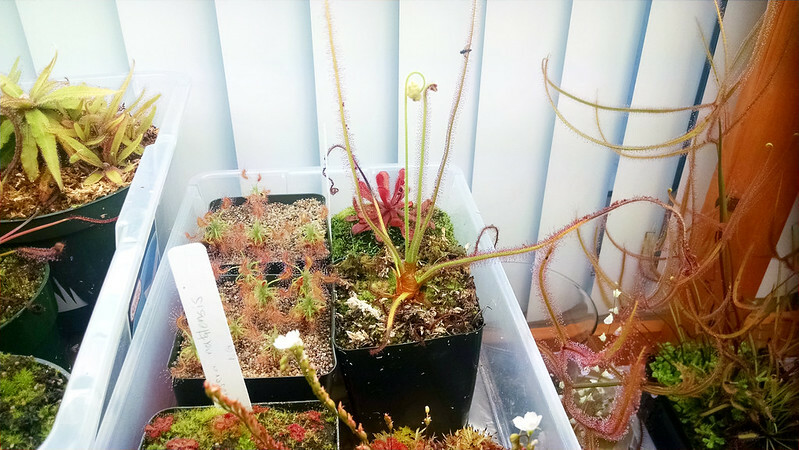 I've also got some weirdness going on with my Drosera anglica CA x HI. It looks weirdly smooshed right now. The nice, big, well-developed leaves are all moving outward and down, as usual, but the younger leaves inside are more sparse and smaller. Also, there's something weird going on right in the center. I'm pretty sure that's a flower stalk! It looks like a malformed flower stalk maybe? It might even be mechanically blocking new leaf growth. How weird. I may do some surgery on it soon to get it out of there. 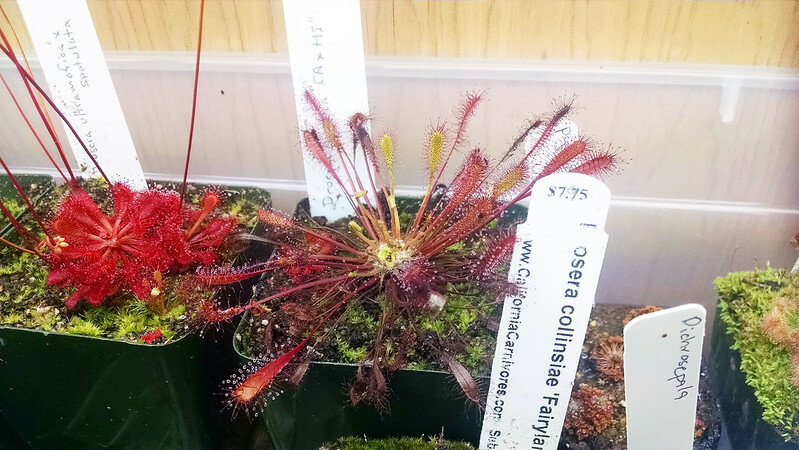 It's not a huge mystery what's happened with this Drosera brevifolia. This is a neat little "habitat" vignette. It has bloomed itself to death. I knew it was coming. I've got some collected seed, so I hope to start a new round of these guys soon. I think the little dew in the foreground is a D. brevifolia rather than some other weed, but we'll have to wait and see. 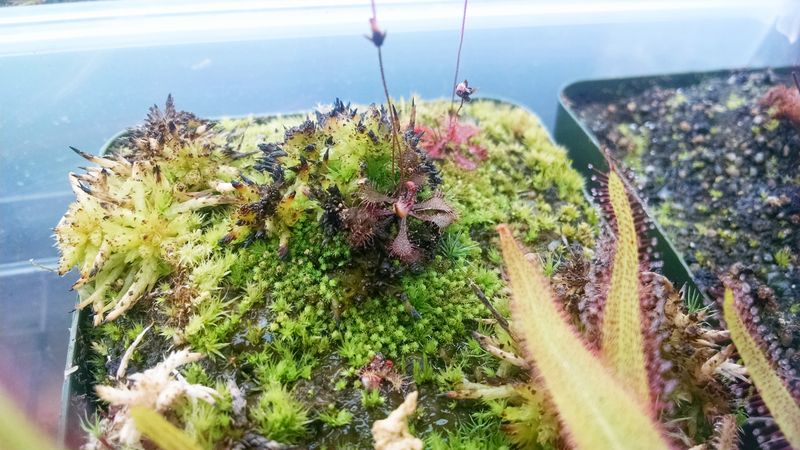 And finally, since it's not all bad news, check out how well that flower stalk on my Drosera spiralis is doing. Whatever you do don't through out that brevifolia if it dies, a recent discovery of mine and confirmation by the folks at meadowview has shown that D. brevifolia can and often will return from its roots after it dies down for a little while, making many people think they are annuals. 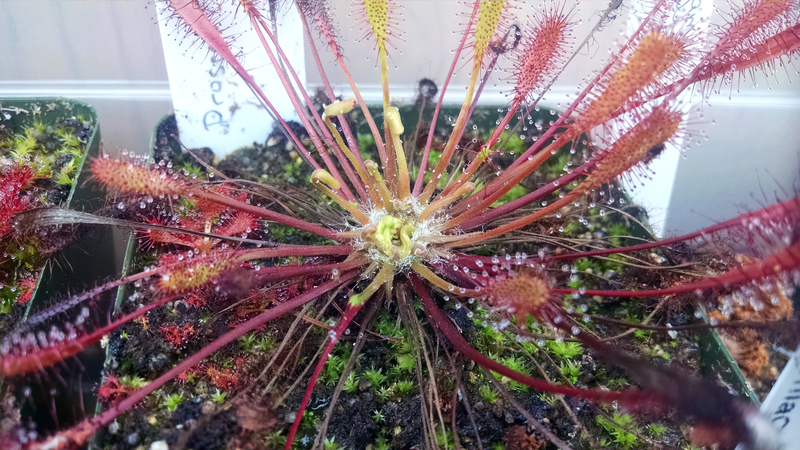 Also, your Drosera anglica looks like it might have aphid damage, not 100% but just from the looks. Agreed. Don't throw out the brevifolia pot. You'll get new plants soon. Mealy bugs, those white bugs in all the nooks & crannies look like mealy bugs. Dump some rubbing alcohol on em & watch'em fry as their exoskeletons melt. Little buggers! 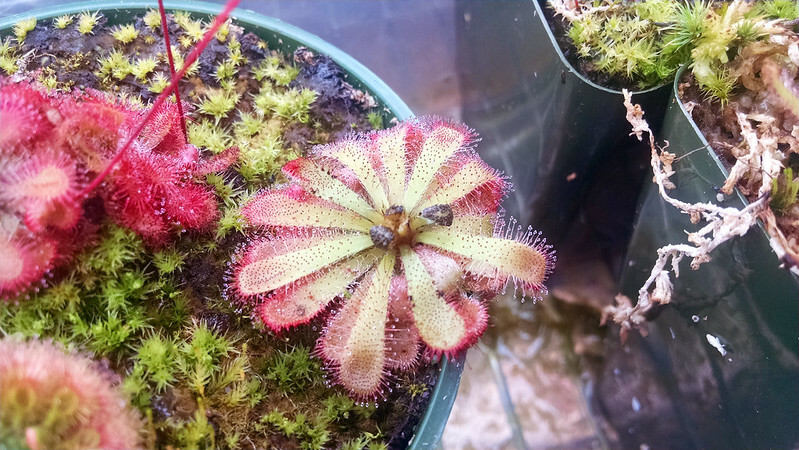 Hi Devon, have you found out why Drosera aliciae has black center? Mine too has black center like in your photo. Do you know what I should do? Many thanks! I think I determined that it is humic acid buildup. You can try flushing your pots to get rid of it. My plant is still alive, even with this buildup. There's one in the same pot that had the buildup for a few weeks, and then it went away. I'm not really sure why this plant specifically has this problem. My aliciae also experienced these blackened center leaves recently. I changed the media from a peat mix to pure LFS, and new leaves came in without the blackness. 100th post! I photographed the whole collection!